One of my favorite design events here in Connecticut is Rooms with a View. Originally conceived by Albert Hadley 18 years ago, the popular fundraiser transforms the Southport Congregational Church into a showhouse featuring twelve 5′ x8′ mini rooms created by local and NYC designers. This year’s theme was “Design on a Shoestring” under the directorship of Honorary Chairman and Parish Hadley alumnus Thom Filicia. Despite the disruptions from hurricane Sandy, the vignettes were miraculously ready for viewing when I stopped by last Friday for the gala preview. Starting in the front room, was, appropriately, a disciple of the Parish Hadley lineage. 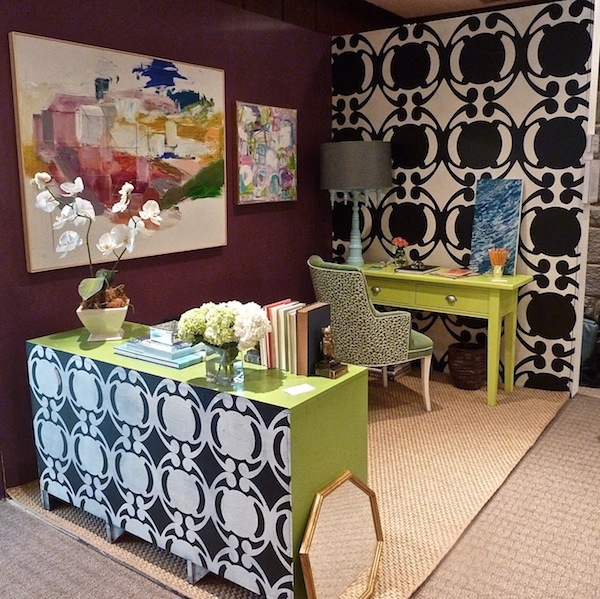 Occupying the space her long time employer and mentor, Bunny Williams, occupied the year before, bicoastal designer Allison Caccoma‘s room was an “Homage to Albert Hadley,” based on his own 2001 Kips Bay Showhouse ‘Homage to Van Day Truex’. I loved the chic blue and raspberry color combination with shots of glamorous gold. 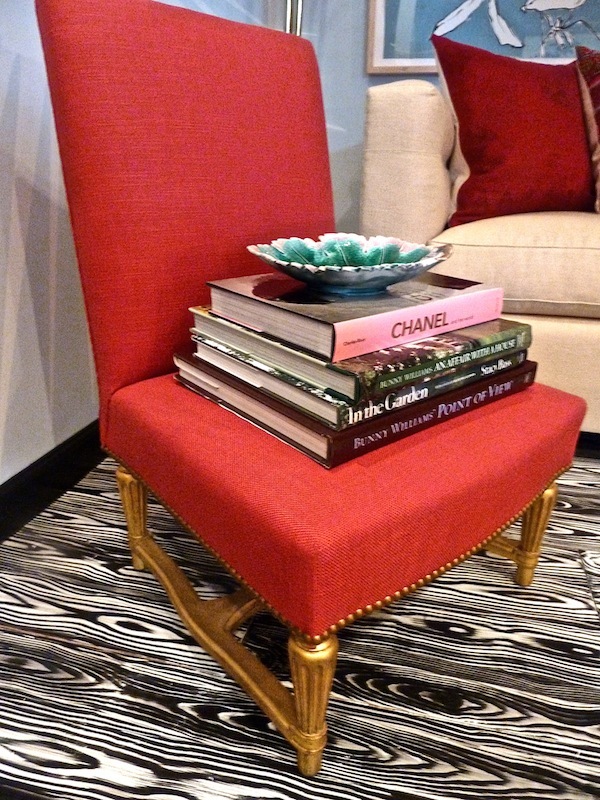 The charming side chair, which actually once belonged to Mr. Hadley, sits on the fabulous floor executed by Art Groove Decorative Painting. 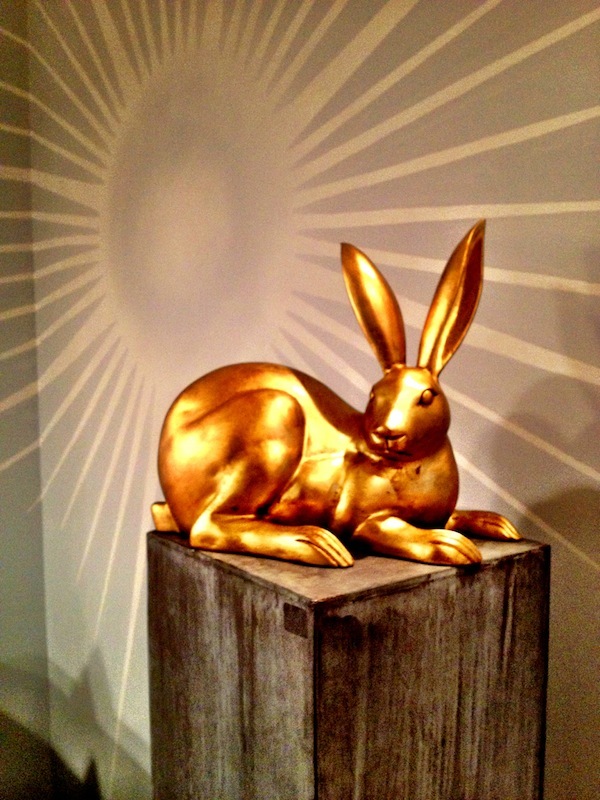 The gold Twitter Bunny, radiant in front of the dramatic sunburst, is part of Bunny Williams’ stylish BeeLine collection. 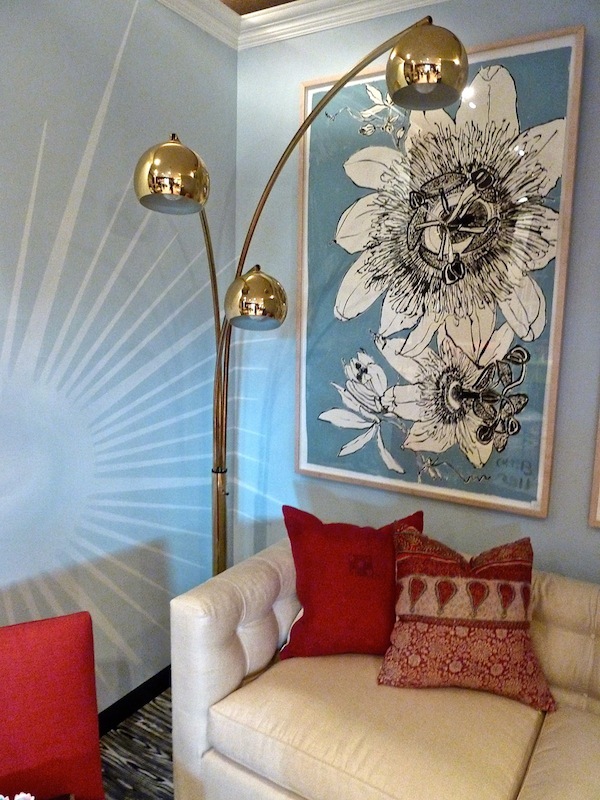 A vintage lamp adds to the eclectic melange with the large graphic Christian Brechneff ‘Passion Flowers’ Painting (one of two) available through Treillage and pillows from Lillian August. 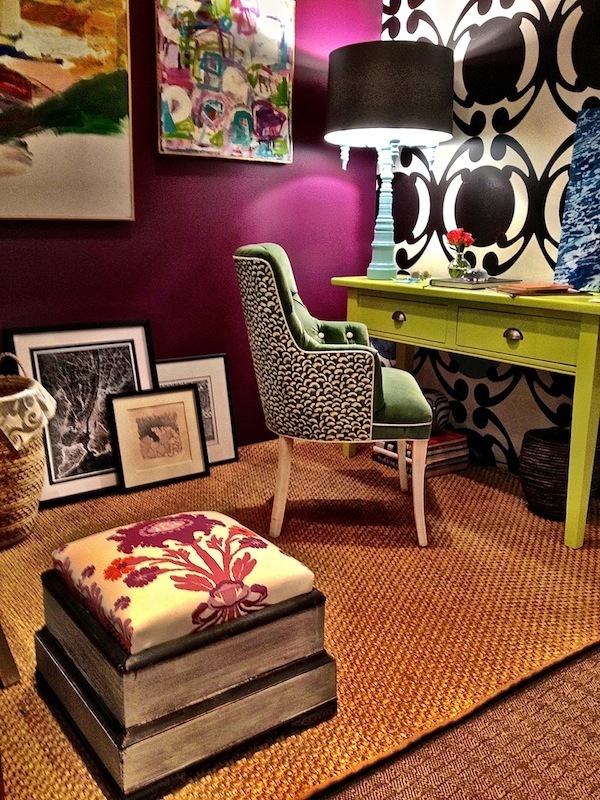 Across the aisle, designer Rebecca Soskin created a vibrant energetic vignette. 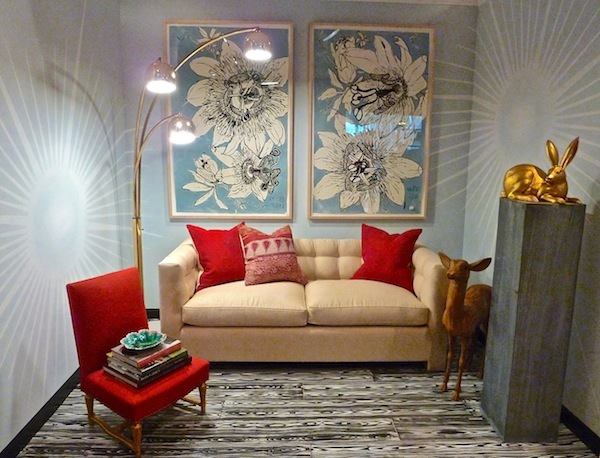 Entitled, ‘Unfinished Business, ‘ the space was imagined as a decorator’s office, created as a collaborative effort by Soskin and decorative artist, Topher Carnes. 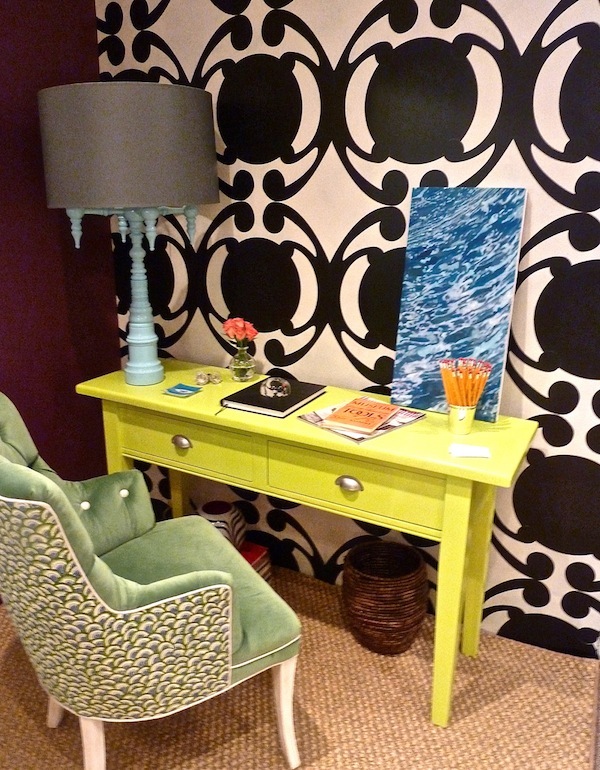 The bold graphic painted pattern defined the space, set against the bright lime green. Together Soskin and Carnes refinished old furniture, reupholstered antique chairs and added bold abstract paintings by various local artists. They wanted to illustrate the drama and ingenuity that a limited budget and a lot of imagination can produce. 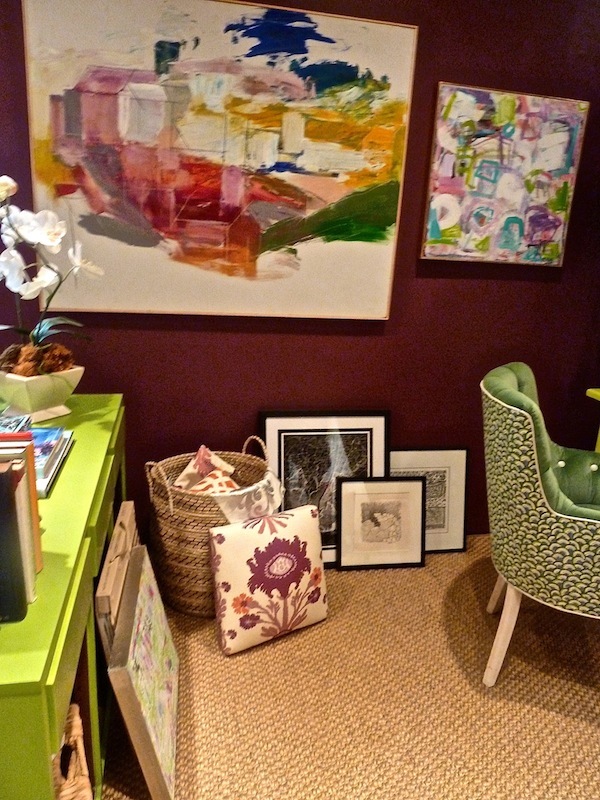 It’s a playful vignette that successfully grabs your attention! I liked that it resembled a real working space with inspiration out and about. 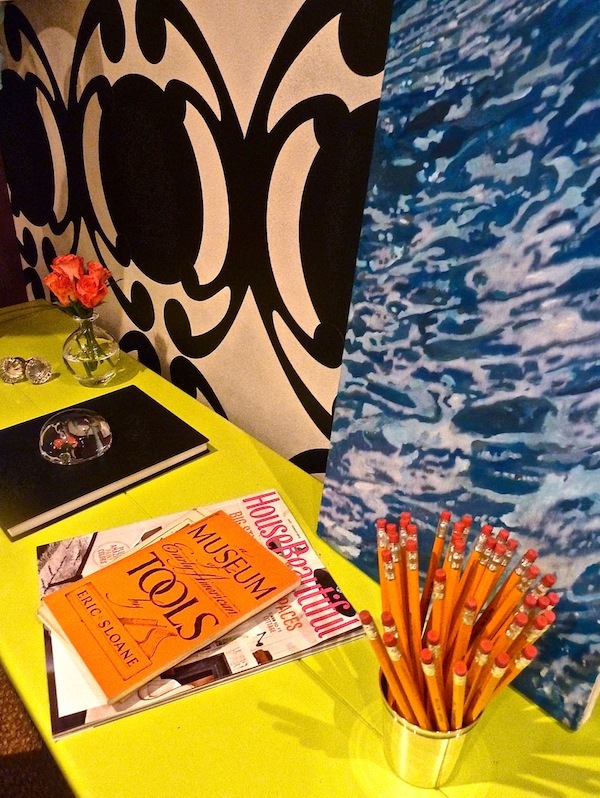 Contrasting colors at the desk collaborated for a dynamic yet pleasing pallette. A pretty tufted chair with a great mix of fabrics worked well with the Dunes and Duchess four arm candelabra lamp in turquoise. Stop back tomorrow as we take a peek at many more Rooms with a View! This entry posted in art, design, furniture, interior design. Entry Tags: Albert Hadley, interior design, Rebecca Soskin, Rooms With A View, Topher Carnes Bookmark the permalink. That red linen chair in Mr. Hadley’s room is stunning! Always fun seeing Dutchess and Dunes lamps they’ve come a long way quickly. Always fun seeing what others can pull off in such a small space and under tough conditions. Beautiful!! Love both spaces Stacey! Thanks taking me on the virtual tour since I won’t be able to see it in person! Would love to see that show. What a fab write-up! Love your images and the explanation of each space. I think it this show is especially remarkable as it show one that even the smallest of spaces can be chic, beautiful and functional. Oh my goodness, the above comment with errors is horrid. I wanted to say that it is remarkable to see how such small spaces can be transformed into chic, beautiful and functional interiors. This is always an event that showcases inventive design, a great tribute to the founder, the late Albert Hadley. 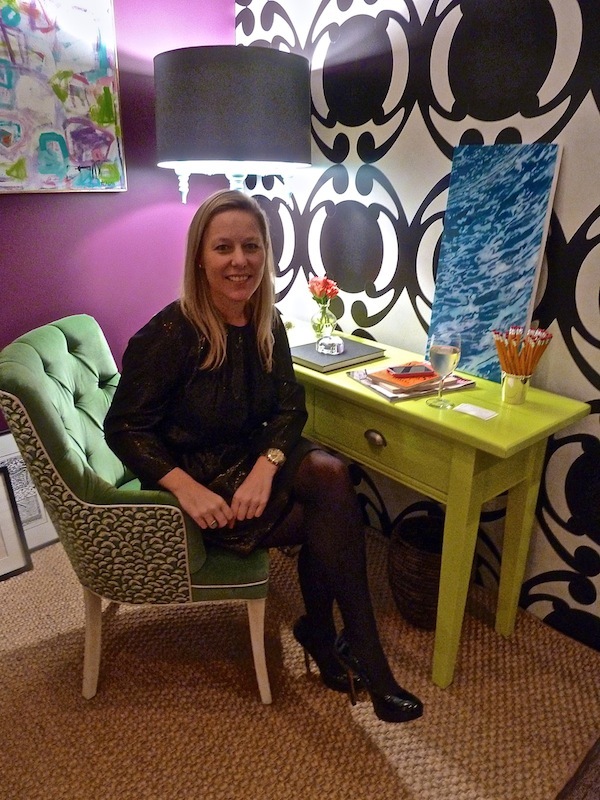 so fun to see you in your world of design! 78 queries in 0.597 seconds.